Good morning everyone! I am so glad it's Friday! I'll be even happier when school's out - lol! I will be stitching tonight with some fabulous gals and I am looking forward to that! The weather doesn't look to great this weekend but I just got some new stamping goodies to play with so I will be happy to do that!! But first I will concentrate on the day ahead. Today's card was inspired by one that Patty Bennett had done. I was looking for something to use my washi tape on and I thought this was really pretty. I had to change a few things to make mine work but I like the way it turned out! There you have it! Thanks for stopping by and have a great day! Such a bright and cheerful card. Love, love! I love the dimension you achieved on that gorgeous lotus blossom.. so rich and striking!! 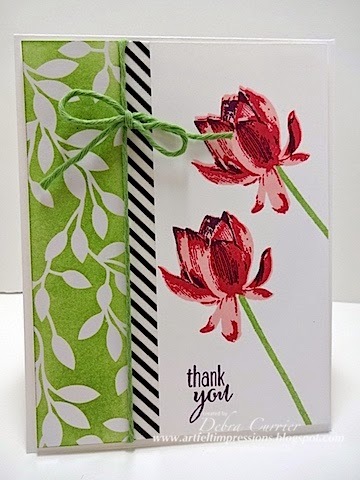 Beautiful use of the washi tape and colored dsp too! Love it!